I have always found the contemporary approach to arching (the curved shape of the front and back of the violin) by simply copying the exterior shape of a classic instrument, through the use of arching templates, very unsatisfactory. My principal objections are that no understanding of the arching design is required or acquired, and therefore does not allow the maker to make intelligent modifications or improvements. 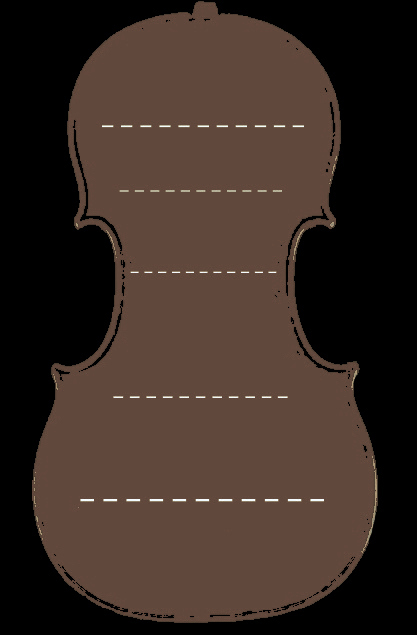 This denies the maker access to the heart of the whole process of violin design. Although much attention has gone into looking at the outlines of instruments and how they might have been constructed using geometrical techniques (notably Francois Denis), far less attention has been given to how the arching was created. This is very unfortunate, as the arching design has such as major impact on the tone and performance of the instrument. A notable exception is recent research presented by the violinmaker Torbjörn Zethelius. Taking observational evidence of the work of several Cremonese masters he suggests that the plates were hollowed first. The advantage of doing this is that the form of the inside of the plate can be guided by the curve made by a small hanging chain. When the chain hangs it forms a catenary curve (catena in Latin meaning chain). This is the ideal curve for any structure required to support its own weight. The catenary curve had long been used in architectural design including buttresses for buildings such as Cathedrals. The buttress would be made upside down and a chain used to guide the mason to create this perfect Catenary curved support. A 1788 note written by Thomas Jefferson reads, I have lately received from Italy a treatise on the equilibrium of arches, by the Abbé Mascheroni. It appears to be a very scientifical work. I have not yet had time to engage in it; but I find that the conclusions of his demonstrations are, that every part of the catenary is in perfect equilibrium. Using a hanging chain to guide the hollowing of the inside of the plate would seem a very feasible and practical approach in a workshop situation. However, I have discovered that recreating this process on the computer allows you to work far more accurately and identify deformation in the archings of old instruments. Crucially, a development of this method, which I will go on to discuss, also allows you to precisely maintain the structural shape of any given arching even if the thickness is changed. After entering the data for several Golden Period instruments I have been able to compare the cross archings (at the 5 regions where normally templates are used – see diagram) with perfect catenaries generated on the computer. My findings revealed how remarkably closely most Golden Period Cremonese instruments adhere to this design. the inside of the plate, or indeed the outside, but the midline that travels equidistant between the two. This is because structural shape of an arch, or bridge, is defined by the line that bisects the outside (top) curve and the inside one. Working on the computer allows you to work with this midline rather than the internal line. When we make arching templates, which is the modern method, they only represent the external shape of the arching. Every piece of wood is different and therefore needs to be thicknessed relative to its own intrinsic stiffness. If the final thicknesses of your front or back are in any way different to the original instrument being copied, the resulting arch will in fact be different. However, if the shape of the midline (between the outside and inside) is maintained then even if your thicknesses are different to the original you can still precisely follow its structural shape. The beauty of this design method is that it gives you a clear representation of how these instruments were made and allows you to reproduce the process with great accuracy and insight. This shows part of the cross section of the front of the 1715 Titian Stradivari taken from the Narrow Point (ie the narrow part of the arching in the centre). The blue line is the catenary generated by the computer and the red line shows the midline between the outside surface and the interior. When you consider that the thickness of the front is less than 3mm it shows how closely the midline follows the catenary. These are the 5 cross-arches taken from the front of the 1735 Plowden by Giuseppe Guarneri del Gesu.